Michael Moore has had a number of successful documentaries, but none have had quite the cultural impact as Fahrenheit 9/11. Released the summer of 2004, the film skewered then President George W. Bush for his premeditated invasion of Iraq after the World Trade Center attack. It not only won awards at Cannes but became the highest-grossing documentary of all-time. 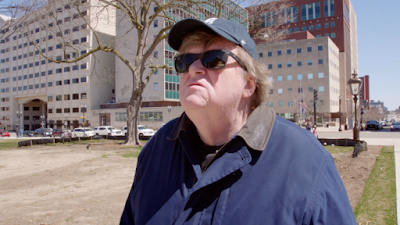 And now Moore is taking aim at the White House again with his latest doc, Fahrenheit 11/9, which debuts its trailer on the same day it joins the Toronto Film Festival lineup. Ever the showman, Moore is having a pretty good time turning his anger towards Donald Trump. He correctly draws attention to the racial divisiveness Trump sews regularly, his cowardice in handling the gun control issue, and the violence that has erupted in his name. You probably already know if this movie is going to be for you. Moore isn't everyone's cup of tea; in fact a lot of people want to punch him in the mouth, including a guy he's talking to in this trailer. But if you dig Moore's perspective this is going to be a must see. I can't wait. Fahrenheit 9/11 hits theaters on September 21st, just in time to have an impact on the midterm elections.